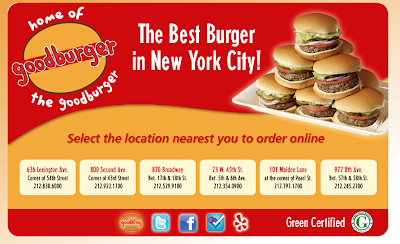 NYC Recession Diary: Every Wednesday in May: $1 Goodburgers! Every Wednesday in May: $1 Goodburgers! In honor of National Burger Month, NYC burger joint goodburger will be dishing up "Single for a $ingle" Wednesdays in May. Customers can come to any goodburger location from 3-5 pm every Wednesday in May and get a mouth-watering single burger for $1, "The Works" included. That's $1 burgers, today and next Wednesday, May 25th. Maximum of 5 burgers per customer, in-store purchase only.